We understand you have choices on where to spend your money for chimney service. Please let us introduce ourselves and toot our own horn a bit in hopes of showing you that not all chimney sweeping companies are created equal. It’s not just about price, it’s about value, and the quality of service you really receive when the Sweep arrives. 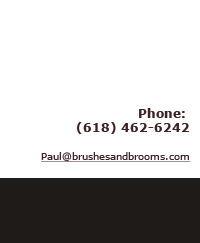 Brushes & Brooms Chimney Service was founded in 1978 by Paul Hempel and Cealy Walter during the first oil embargo and the turmoil that followed, and has been a continuous family operation ever since. It’s our only business and our full-time focus, not something we do on the side. Our business philosophy was to keep it small and simple to insure our customers got the best service possible and the best value for their dollar. 30 years later that’s still true. Paul still services all the chimneys and Cealy still takes all the phone calls. You won’t get a newly hired, barely trained service tech working a part time job. Personal service is not just an advertising line at Brushes & Brooms, it defines us. There are no strangers on the phone or in your home! A seat on the Board of Directors and the Executive Committee for both the NCSG and CSIA for 6 years. And most importantly, the thousands of satisfied customers that invite us back to their homes for service year after year. At Brushes & Brooms we promise the best of old fashioned personal service combined with the latest knowledge and technology. Your job, no matter how large or small, is not finished until you are 100% satisfied. And that’s our personal guarantee.